Mix all ingredients except oil and celery seed in a blender. Gradually add oil and celery seed and continue blending. Toss with Salad or pass for individual goodness. Dressing keeps 3 weeks in fridge - yeah, make it again! grill 2-3 minutes on each side on high to sear the meat. reduce heat to med-low and grill 8 min on each side. whisk. dip da meat. eat da meat. serve with baked sweet potatoes. Cook tortellini according to package directions; drain and rinse in cold water. In a large bowl, combine the tortellini, fruit and chicken if desired. In a small bowl, whisk the syrup and orange juice; pour over salad and toss to coat. Cover and refrigerate for at least 1 hour. Sprinkle with cashews just before serving. Yield: 6-8 servings. wrap them with bacon and put them on a skewer. Then baste them with Famous Daves Sweet and Zesty BBQ sauce and thow on the grill. YUMMY! Also it is good to use extra thick bacon for wrapping. No Title, but it looks like Cowboy Caviar? I have also made it with a little red onion, really tasty too! Line the bottom of 13x9x2-inch dish with 1 bag of cookies and layer bananas on top. In a bowl, combine milk and pudding and mix with a hand mixer until well blended. In another bowl, combine the cream cheese and sweetened condensed milk together and mix until smooth. Fold the whipped topping into the cream cheese mixture. Then add the cream cheese mixture to pudding mixture and stir until well blended. Pour the mixture over the cookies and bananas and cover with the remaining cookies. Refrigerate until ready to use. 1. Preheat oven to 350. Grease and flour two 9" round cake pans. will be thin. Pour evenly into two pans. 3. Bake for 30-35 minutes (toothpick test). Cool in pans for 10 minutes, CAREFULLY turn out and finish cooling on wire racks. Cream butter, cocoa, corn syrup, and vanilla. Add powder sugar a cup at a time, add milk 1 T at a time. Mix it up like crazy until it is light and fluffy and oh so good. Allow cake to sit. Sit and get all good inside. Mmm. Mmm. Mmm. Take off outer layer of husks, and soak corn in water (with some husk still in tact) for 15 minutes. Preheat grill to a medium temp, about 350 degrees. Remove corn from water, pull back husks (but don't remove them) and remove and discard silks. Brush olive oil over corn, add salt, pepper and other herbs if desired. Pull husks back over the corn and tie ends closed with twine or spare husks. Place cobs on the grill, turning corn to keep it from getting charred too much on one side. After corn has been cooked all the way around, place the cobs in indirect heat, and close the cover. Allow corn to slowly cook for another 15 minutes. Rotate a couple more times while cooking, and keep close watch as overcooking will result in mushy corn. When the corn is done, remove it from the grill, peel back the husks and enjoy! You can serve with butter if desired. Oh, and be careful- corn is extremely hot right off the grill! It's the BEST dip you'll ever have. I make it for every party, and it's super good on grilled salmon, thrown in taco salad, or just eaten by itself! MIx together ingredients, except avocado. Refrigerate for at least one hour. When ready to serve, drain the marinade, add avocado, and serve with chips! Looks like I will be making my way to the grocery store. Yummy, thanks for sharing! 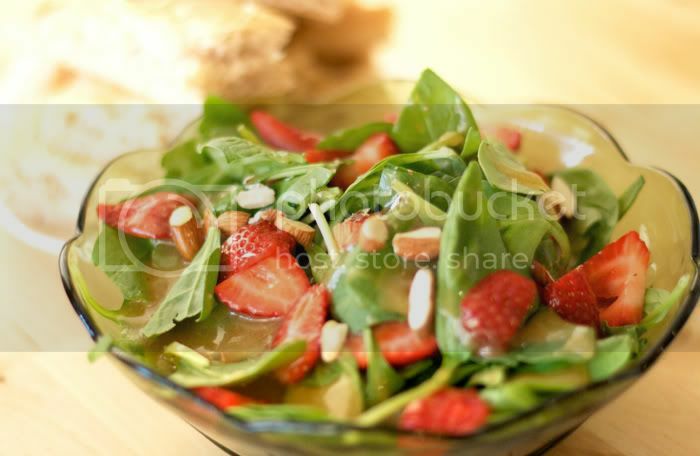 wow, that strawberry spinach salad looks amazing. i'm gonna try it. um, i also need this cake! seriously, i have a major chocolate addiction this pregnancy. i'm gonna make that dreamy chocolate cake for eric this weekend. he's gonna be so glad he's a father.